The nomads roaming parts of western Asia and northern Africa share key characteristics with Vermonters, says Burlington artist Valerie Hird, despite the vast geographic and cultural distances separating them. "They help out one another," the painter and traveler explains in an interview at her home studio on North Avenue. "They're hospitable to strangers. They're living at a subsistence level of animal husbandry. It all reminds me of the farm I grew up on." Born in Massachusetts in 1955, Hird moved with her parents to a Northeast Kingdom dairy farm when she was 7 years old. She's lived in Vermont much of her subsequent life, with stints at Beloit College in Wisconsin (where she dropped out after two years) and the Rhode Island School of Design (where she earned a bachelor of fine arts in painting). Hird now spends a couple of months a year at the Key West, Fla., winter home of her partner, Frank Marshall, whom she describes as a "blissfully retired" film producer. Having studied archaeological illustration, Hird managed, in the mid-1980s, to get a couple of gigs on digs. She started in Panama, an experience she loathed, then went to Egypt, where she encountered desert tribes that would transform her art. Most years since then, Hird has returned to live among the Bedouin, Berber, Turkic or Kirghiz peoples for a month or more. She always presents her hosts with gifts of gratitude, but she acknowledges having received much more than she has given. Pointing to some of the earth-toned textiles she acquired in her travels, which now cover her living room walls with geometric patterns, Hird notes, "They have the shape and the drape of the landscape." Her own compositions, she adds, have been profoundly influenced by these weavings made exclusively by women. "My work is a reflection of their textiles and the stories they tell," Hird explains. Hird is especially smitten with creation myths, as evinced by her current show, "Origination," at the Nohra Haime Gallery on Fifth Avenue in Manhattan. 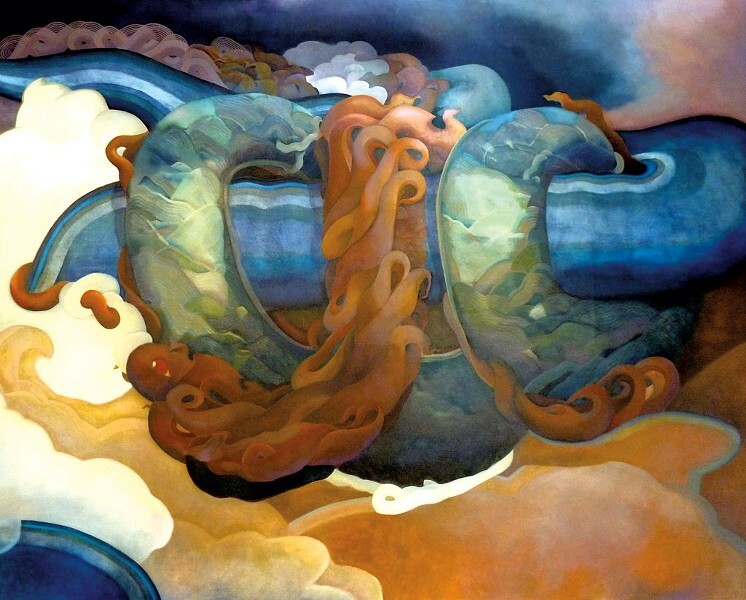 In this grouping of 16 oils, she depicts the birth of the elements — earth, air, water and fire — and their coalescence to form our planet and the universe beyond. The two largest pieces, each 8 feet by 12 feet and each priced at $120,000, resemble the Hubble space telescope's dumbfounding photos of stars being spawned in cosmic eruptions. A couple of the smaller works, which go for $15,000, show seeds thrusting forth tendrils that are becoming vines. 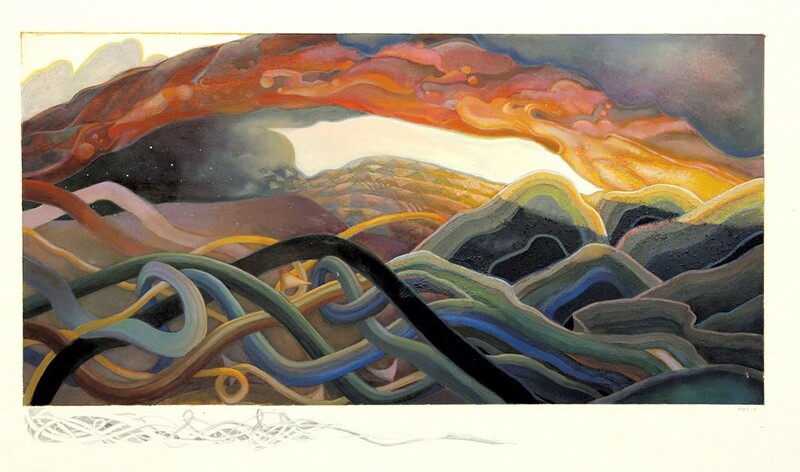 And in some midsize paintings, twisty strands resembling double helices writhe beneath an unsettled sky. The "Origination" series focuses on the foundation of the natural world. Hird doesn't want her renderings of the birth of Earth to be seen as a prelude to the arrival of humans — who, she says, will appear in a suite of paintings she expects to compose in a few years. Hird's sketchbooks attest to her ability to produce human figures: They include convincing renditions of people she's met in souks and encampments. Humans were likewise absent from Hird's 2012 show at Nohra Haime, titled "The Fifth Day." Another creation series, it portrayed the formation of land and seas illuminated by primordial light and culminating in the arrival of birds, which the God of the Old Testament is said to have incarnated on the fifth day. While the colors and patterns of Hird's compositions, then and now, include some similarities to the tribal textiles she collects, passages in a few of her paintings can also be read, at least by Vermonters, as semi­abstract views of the Green Mountains. The artist doesn't dispute that interpretation. "My work is a product of all I've seen," she says. How did an artist with a modest portfolio and no connections to the New York art world manage, in 1992, to place her work with a prestigious gallery? With a combination of chutzpah and talent. Hird did what many young, ambitious artists do: She sent slides of her work to a scattering of Manhattan galleries. Nohra Haime, a dealer from Colombia, was sufficiently intrigued by Hird's sampling, the artist relates, to tell her to produce "a real body of work and then come back and show me." Hird, who had founded a gallery of her own — Passepartout — in Winooski in 1978, duly dropped everything and worked for two years to produce a cohesive set of paintings in a signature style. Haime was impressed. Hird was nonplussed — and still is. "Quite honestly, I didn't deserve it," she says of her sudden access to high-end buyers. "Nohra is very aggressive in her pricing," Hird observes. 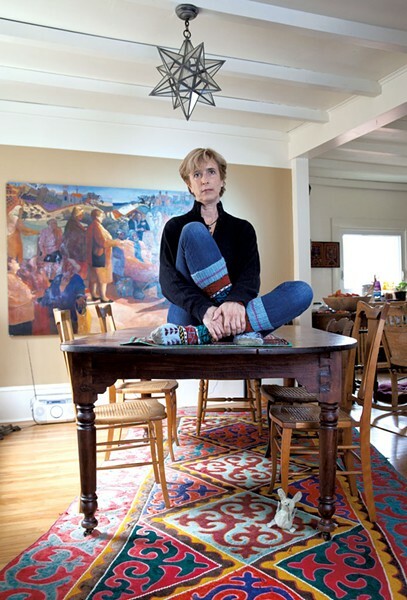 Even with the 50 percent cut the gallerist gets on every sale, it doesn't take too many purchases to bring some financial security to a Vermont-based artist such as Hird, who has also shown her work at local venues like the Amy E. Tarrant Gallery in Burlington. Her annual income isn't as sizable as some might assume, she cautions. Hird has worked as an adjunct instructor of studio art at Saint Michael's College for the past 14 years. The combination of painting and teaching income has enabled her to add a two-story studio at the rear of her warmly furnished clapboard home. Apart from a table strewn with paint tubes and brushes, Hird's studio shows few signs of artistic activity at the moment. She's been commuting regularly to Haime's gallery and looking for other opportunities to show and teach. But one piece in her airy workspace commands attention: an origami bird suspended from the ceiling. It sports a tail that turns out to consist of several smaller birds folded from white paper. The avian assemblage marks the beginning of a new body of work that will make use of animation, Hird says. "My vocabulary," she explains, "is way bigger than just painting." The original print version of this article was headlined "World Views"